After farming culture, artisan culture is the second most famous culture of India. India is known as the land of artisans and craftsmen and is famous worldwide for preserving its art and culture. Thousands of artisans still earn their bread and butter by making handmade clothes and accessories. With industrialization and modernization, India has still succeeded in maintaining its original art forms and has also managed to take it on a global platform. Artisans of India are mostly known for creating crafts like Kalamkari, Bidri art, Jaipur stonework, Bandhini, Jute, and Leather. These artisans have been passing on their art from generation to generation in order to preserve it. Even though handcrafted products are distributed all over the world, major manufacturing still takes place in the rural and small towns of India. It is still a major source of income for many rural communities. The Indian handcraft industry generates employment for over six million people and 67,000 export houses all across the country. There has been a consistent 15% growth every year in revenue generation from the handicraft industry. 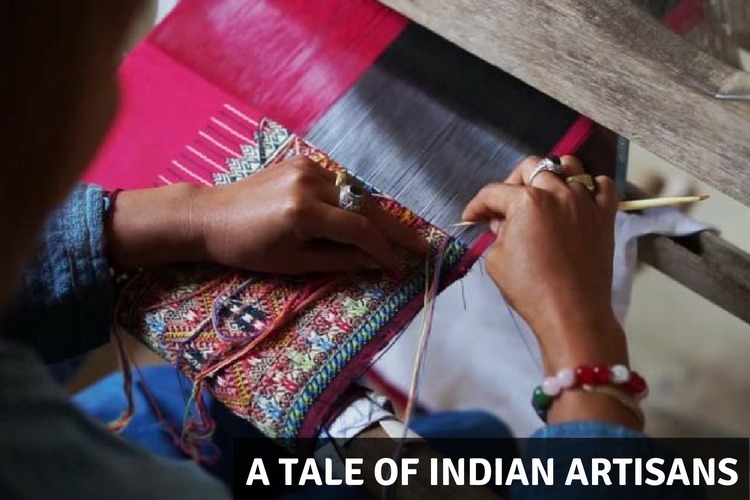 Although Indian handicrafts have earned international recognition and huge demand globally, until few years back, many rural artisans working and sewing stunning beautiful products have been ignored because of the modern culture taking over India. Everybody chooses to wear foreign brands as it is considered as a status symbol. But in the recent years, many brands have emerged with the motive of giving the respect and value to the artisans and the products made by them. Such products are also being considered as status symbol and been given a brand status. The shape of the handicraft industry is changing and in the coming years, one can expect global fashion giants adorning pieces or taking inspiration from the Indian prints and patters!